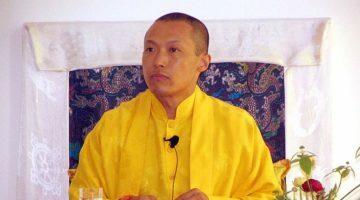 Taking refuge is the moment when we say, ‘I’d like to do things differently now.’ At that moment, explains Sakyong Mipham Rinpoche, the seed of enlightenment is born in us. The Tibetan word for refuge is chup, which means “to be protected by.” Every day we wake up and tacitly take refuge in something that we think will offer us security and protection. Most of the time we put our poker chip on the little thing that says “desire.” We spend our time chasing worldly gains; we take refuge in money, in having things, in winning, in avoiding loss. But while there’s nothing inherently wrong with external pleasures, when we believe that our happiness depends on them we’re engaging in samsara—a Sanskrit word describing a circular and endless process that results in pain, suffering and disillusionment. We work hard for what we think we want, and even when we get it, we don’t feel the happiness we expected. In formally becoming Buddhists we take refuge in the three jewels: the Buddha, the dharma and the sangha. 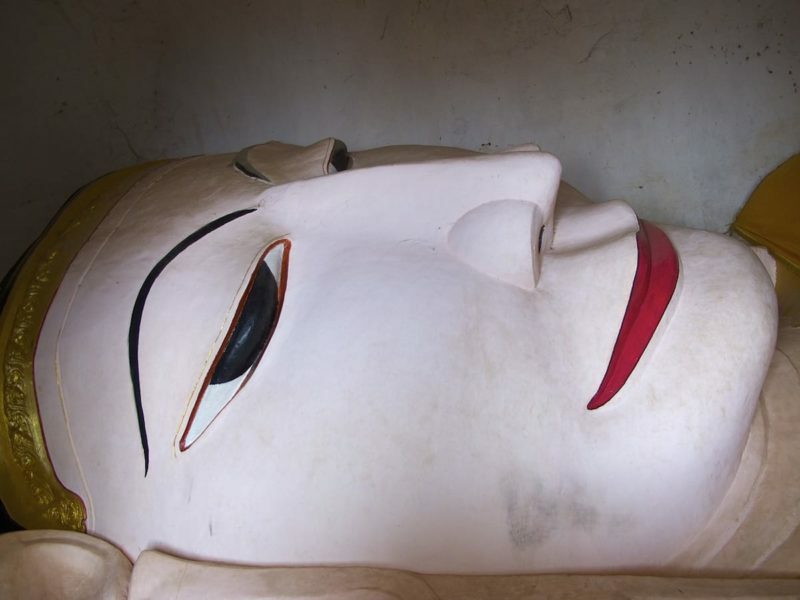 We take refuge in the Buddha as teacher, our example of an awakened being. 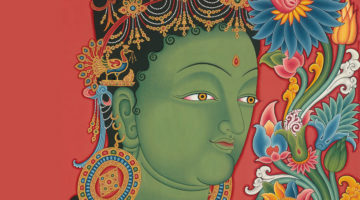 The Buddha also represents the potential for enlightenment that we all possess. Taking refuge in the Buddha is taking refuge in our own enlightened aspect. He’s our role model for someone who went through a personal struggle and came to rest in wisdom and compassion. We also take refuge in the dharma—the truth that the Buddha expounded. This includes his literal words as well as the inner truth to which the words are pointing. Fundamentally we’re taking refuge in the notion of selflessness or emptiness, luminosity, suchness. The dharma is the fundamental nature of things. It’s the way things are. The third jewel is sangha, a community of individuals who come together to practice, who know what to accept and what to reject in order to go forward on the path. We come together to cultivate the qualities that take us toward enlightenment. We reject the qualities that take us in another direction. In the beginning we’re in a bewildered state. We don’t know what to accept and what to reject. We know things aren’t working out, but we’re not sure why. That’s usually because we react with either aggression, attachment or confusion to whatever we encounter. We’re so busy trying to avoid what we don’t want, get what we want, and ignore our suffering that we don’t even know what we’re doing. Unless we wake up to how it works, our life can be a process of alternating these negative emotions. They disturb our inherently peaceful mind, reinforce the notion of a solid self, and cause more suffering. That’s why these qualities are known as the three poisons. When we practice shamatha meditation—peaceful abiding—we look at our minds and see what’s happening. We’re able to say, “Oh, here comes a moment of anger.” We begin to see how we use anger to maintain the solidity of “me,” even if it means hurting others. We also begin to see how often we use anger as a way to work things out: “I’m going to get angry. Then I’ll get what I want.” But looking at the dharma (reality) of the situation shows us that the result of anger is always more pain. That’s how we usually engage with our lives. The Buddha saw this seemingly simple truth and showed us how to open our eyes and see what’s actually going on. Is there anything in our lives that’s ever remained permanently? No, there’s only impermanence. Is there anything we experience in which we can find a solid identity? No, we’re always in a state of flux. Is there any situation that isn’t inhibited by suffering? Our happiness is a slippery situation. Suffering is always going to catch up with us. 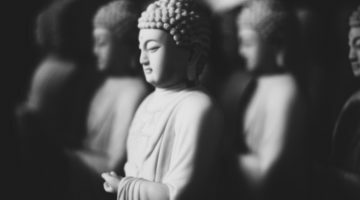 The Buddha taught that we need to see the truth of how things are because in fact, as real as it seems, the pain too is ephemeral, empty and without entity. Taking refuge in the three jewels, we begin to see a larger perspective: living as if aggression, desire, and confusion is going to lead to true happiness is like planting tomatoes when what we want is apples. To get what we want, we need to plant the seeds of virtue: love, compassion and wisdom. Taking refuge is the moment when we say, “I’d like to do things differently now.” At that moment it is said that the seed of enlightenment is born in us. We want to stop perpetuating samsara. It takes tremendous conviction to give up being mad, to give up being jealous, to pull our heads out of the sand and acknowledge suffering. It’s not an easy path to follow. But when we take refuge, we aspire to turn our minds away from the samsaric way of living and to cultivate compassion, loving-kindness and wisdom instead. We decide to nurture the seeds of genuine happiness. That’s difficult to do on our own. So we take refuge in the sangha. These are the people who can support us, to whom we can look for guidance. Together we’re trying to understand that dwelling in anger, desire and bewilderment is not going to lead to liberation. We’re acknowledging that we’ve been in a reactive state: if somebody has said something we didn’t like, we’ve responded automatically with jealousy, anger or denial. We’re saying that we can now be proactive, in accordance with compassion, love or wisdom. In order to create that space where we’re not inundated by negativity, we need to cool the mind. We need to nurture a mind that is stable, strong and clear enough to handle the rigors of this process. If our mind isn’t like that, even if we want to choose a more proactive path, we don’t have the option. We need to settle the mind, settle the body, begin to breathe. Meditation is how we as a community step on to the path of virtue. Together we’re taking refuge in the Buddha’s teaching that there’s a way out of this circle of aggression, fixation and ignorance. By practicing peaceful abiding together, we’re offering each other the strength and courage to develop our enlightened qualities. We’re tilling the soil, planting the seeds, and watering the love, compassion and wisdom that sprout forth. We’re acknowledging that before we can better the world, we need to relate to what’s happening in our own minds. At the same time we’re developing a compassionate community through which we can engage the world in a different way. We’re establishing a culture based on the foundation that each of us has the genes for enlightenment.